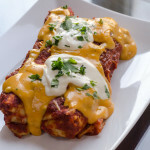 For Cinco De Mayo I decided to veganize a family favorite veggie enchiladas recipe and jazz it up with a new recipe for nacho cheese. This nacho cheese sauce is so good I find myself looking for things to smother with it. Yes, it is that good. So, of course I added it to my veggie enchiladas. 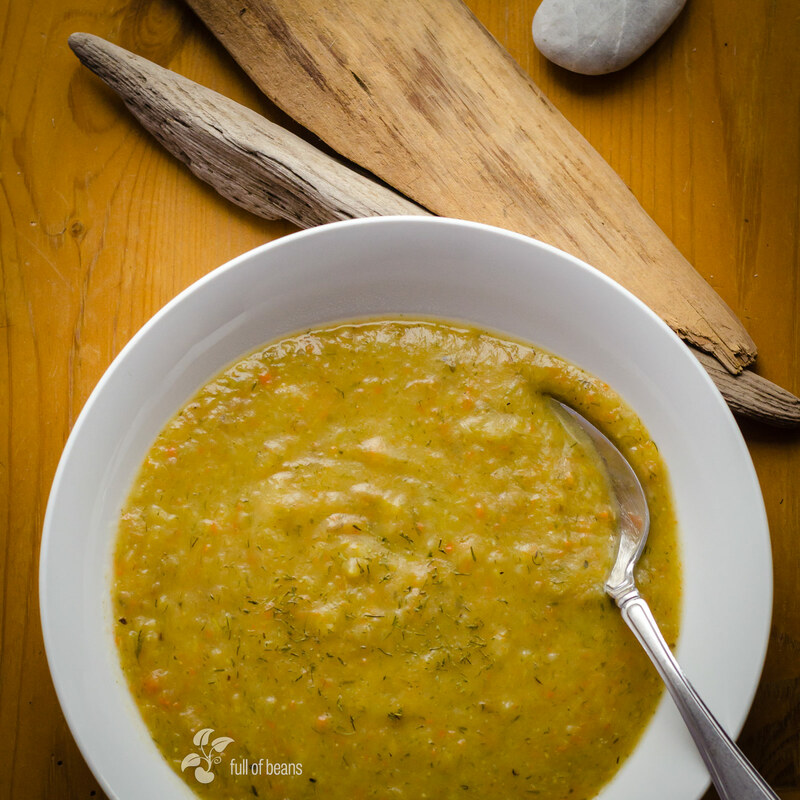 I adapted this recipe when my kids were pretty young and I wanted them to start cooking. I thought it would be fun until I realized it required me to let them use a knife. While they were old enough, they had little experience and, as an Emergency Room nurse, I confess that the thought of having to go to work on my day off was as unappealing as having them get cut. Nevertheless, we gave it a go. I took some deep breaths and tried not to be too controlling with the hopes that they might find cooking fun. Their enthusiasm for cooking was mediocre until they tasted the results. Even I was surprised at how good the enchiladas came out. 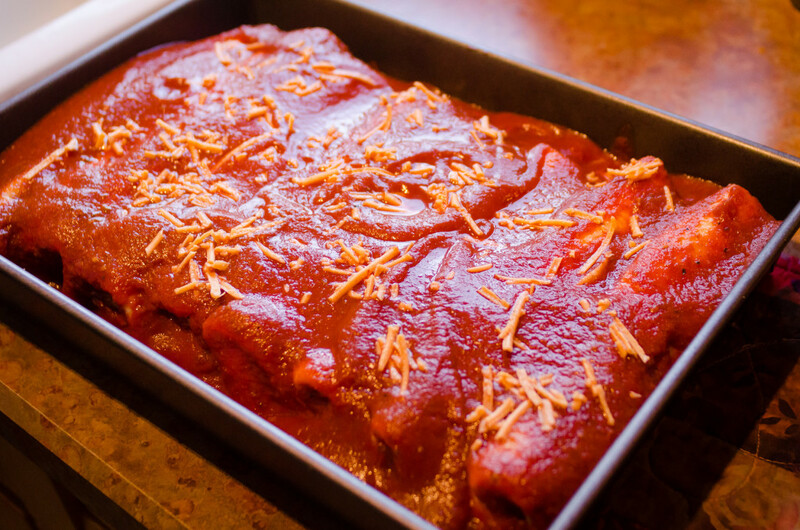 While we were using dairy cheese at the time, I believe the vegan version of these veggie enchiladas is even better tasting, better for you and certainly better for the planet and the animals. If you are struggling with getting your kids to try new foods or transitioning to a vegan or even more vegetarian diet, I cannot encourage you enough to share the kitchen with them. Getting them involved in the meal preparation, even if they are resistant at first, is essential and there is nothing like their looks of surprise and pride when they make something that everyone enjoys. 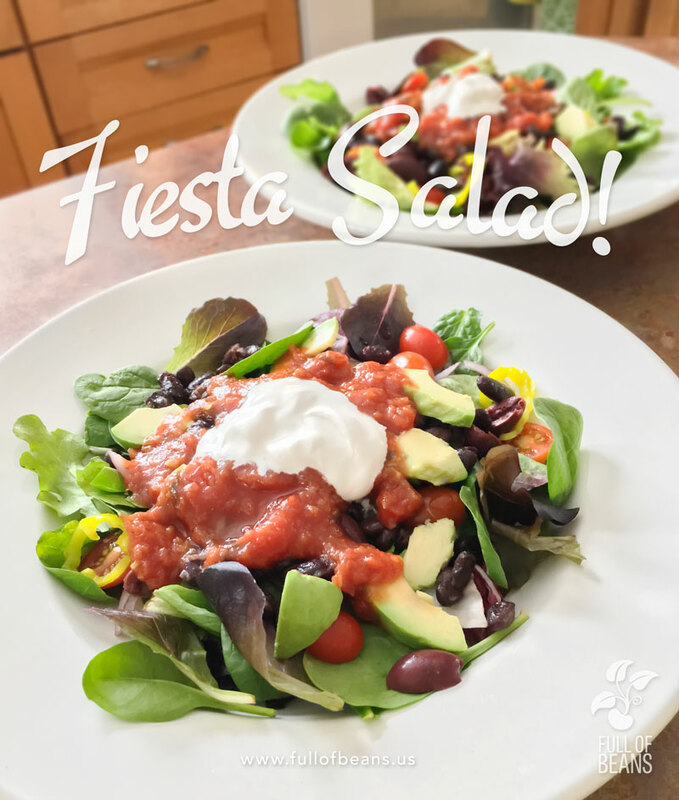 Because this recipe has a few different tasks (stirring, chopping, rolling the veggie enchiladas) it is a great one to try with new cooks or hungry friends. The cooking and assembling is barely more complicated than a stir fry. 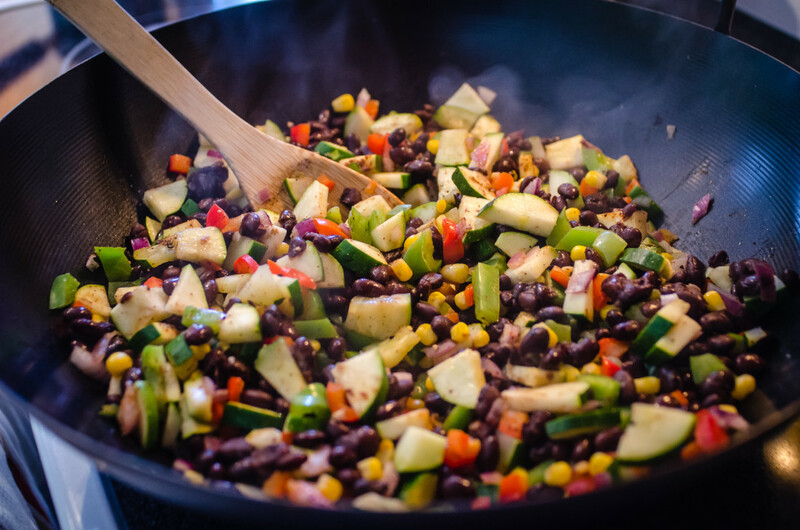 Chop up the peppers, onions and zucchini, toss them into a wok with the other ingredients and cook. 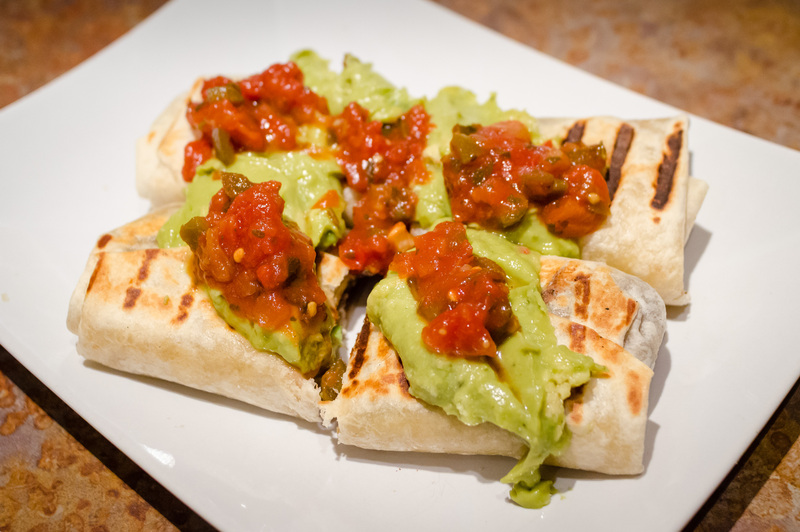 Then place them in the tortillas, wrap them up, and into the pan they go. veggie enchiladas assembled, topped with sauce and shreds, and ready for the oven. Combine all ingredients in a blender and puree until smooth and creamy. Chill until ready to serve. note: I have used regular firm tofu and it has been fine. Tofutti also makes a great sour cream that is available in most grocery stores and is a fine substitute. 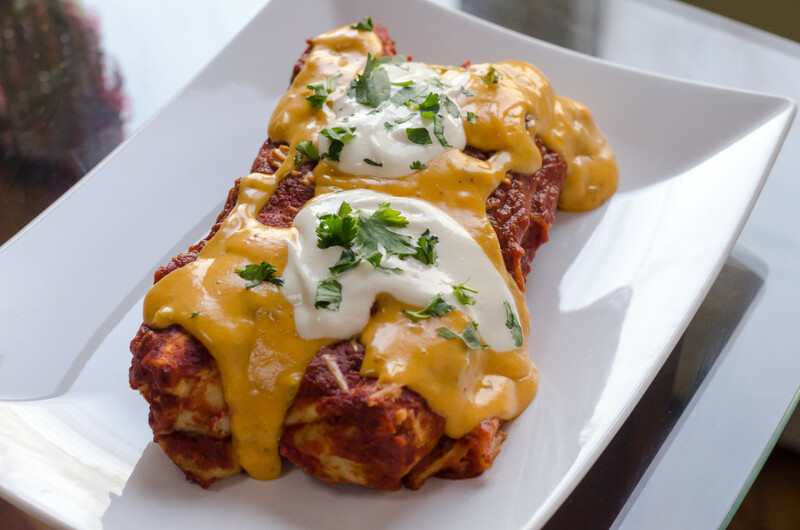 Delicious black bean and veggie enchiladas, topped with the amazing nacho cheese sauce and sour cream. Dig in! Wonderful delicious meal for a family (or party) or just to enjoy for multiple meals. 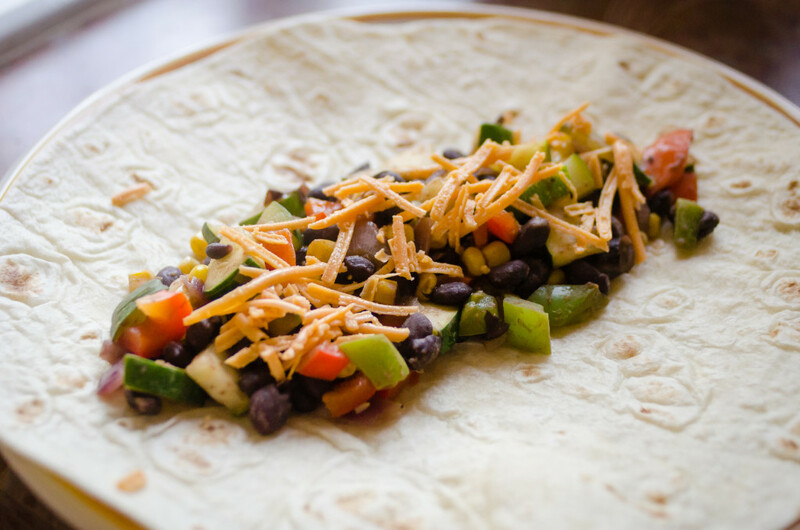 Filled with beans and crunchy veggies for yummy texture and nutrition. Lightly oil a large skillet and sauté over medium to high heat the bell peppers, onions, corn, and zucchini until softened, approximately 5 minutes. Toss in the spices, black beans and salt and pepper until heated through and well combined. Remove from heat. Lightly oil a 9×13 pan. To fill tortillas, lay each flat on a work surface and fill with approximately 1/2 to 2/3 cups of the bean mixture, depending on the size of your tortilla. Sprinkle with a scant 1/4 cup of vegan cheese shreds, if using. Roll up tightly and place in prepared pan, seam side down. Repeat with remaining tortillas and place them side by side. Pour sauce over enchiladas and sprinkle with more cheese shreds if desired. Serve with Nacho Cheese Sauce and/or Sour Cream. Garnish with fresh chopped cilantro. Mix all ingredients and heat gently. 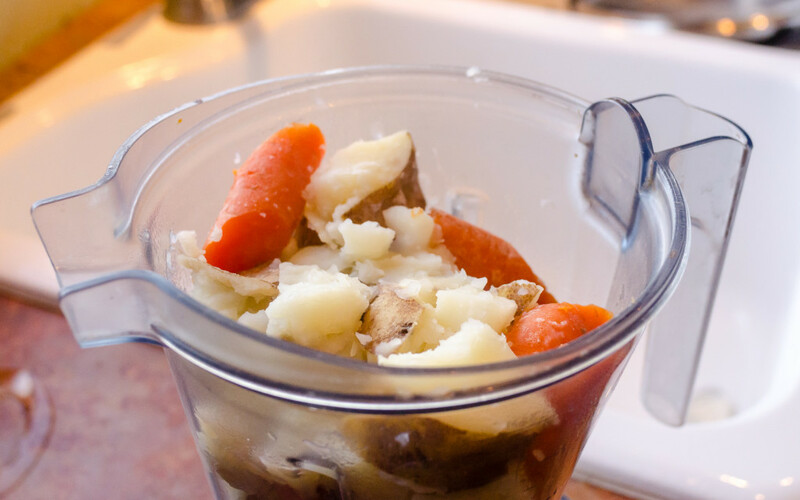 Steam potatoes and carrots together until soft. 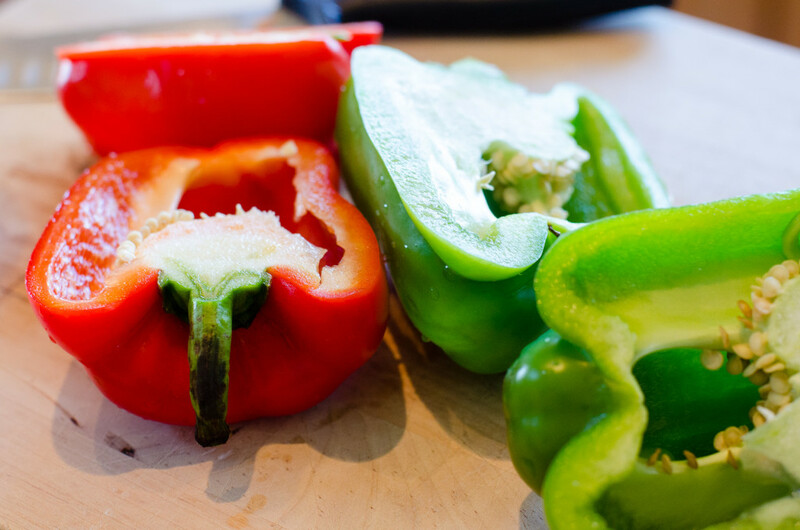 Blend with remaining ingredients, except peppers, in blender until smooth and creamy. A Vitamix is excellent for this task – we depend on ours! We are gonna use your cheese recipe for our Mexican Potato Wedges post coming up soon!! It looks so creamy! Sooo, did you like it? How did it turn out? Please let us know! has anyone tried this with green enchilada sauce? Can this be frozen with or with out sauce on them. Hi Lory, we have never done it, but I would try cooking it as directed, sealing it well, and freezing it. I think it should be fine. For using I would put it frozen into the oven and heat it for about an hour at 350°F. Let us know how it turns out if you give it a try. ? Thank you for this recipe, I tried it tonight and me and my omnivores just loved it, definitely going to be a regular dinner for us. Oh my gosh….I bow down to you for this delicious vegan recipe!! The couple of changes I made pertained to the nacho cheese: I added a can of rotel instead of fresh jalapeno. I removed the skin of the potatoes after boiling, I’m not sure if you included skin in your mix. And I added about a teaspoon of garlic powder. I also didn’t have nutritional yeast or shredded cheese at all AND EVERYTHING TURNED OUT AMAZINGG!! Thank you, thank you. Oh my, thank you so much! It means more than you know to get feedback like this. Thanks for visiting the site, making the enchiladas, and taking the time to come back and leave your lovely comment! I’m curious if you have froze this before? Prepping some freezer meals and would love to add this to the list! Thank you so much for letting us know and thank you for trying the Enchilada recipe. We’re glad you enjoyed it – its a fav of our’s. Please let us know if we can help you in your transition in any way. is there a substitute for the red wine vinegar in the sour cream, I can’t have alcohol at all. I think you could probably just omit the vinegar and and a little more lemon juice. Tofutti makes an excellent vegan product called “Sour Supreme” that you might try. Its very good and doesn’t have any vinegar in it at all. Please let us know how it works out! I am on weight watchers and my husband cardiac diet. I made this tonight with no salt tomato sauce and salt added black beans. I also didn’t not put cheese sauce but we put fat free sour cream when serving it.Since I only had 9 small corn tortillia I just made layers instead of rolling them. Worked out perfect! Thanks! Oh, thank god you improvised! We do it all the time in our house – so glad it worked out, thanks for letting us know. This looks delicious. I have changed the way I cook for my family after reading the Forks Over Knives book and have a question regarding the cheese sauce. Is there anyway to make the sauce without using the olive oil? Regarding your question: first of all, isn’t Forks Over Knives amazing? It changed so much for us. Anyway, we’ve never made the recipe without the oil, but you could try reducing it a little and see how it works. But that recipe makes a giant batch so the 1/3 cup of oil is spread over many many servings (and you can always be sparing with it if dietary fat intake is an issue). We really need to add nutritional info to the recipes (its a little bit of extra work, tho) but we have roughly figured this one out and, per serving, its still quite a “win” over dairy cheese sauces. Thanks for commenting – hope this response finds you out there in the internet! Sorry we missed your question for a few days. I have never tried making it the day before, but it should work OK. The tortillas might get saturated, though. Perhaps assemble the tortillas but wait to pour the sauce on until its time to bake.